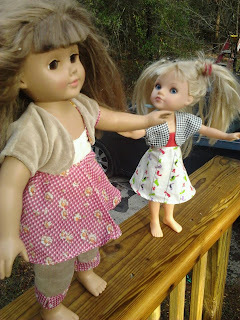 I am addicted to making clothes for the kid's dolls. I wake up early to sew. Really early. Like 4:30 in the morning early. I wake the Hubs up early to see what I have made. At 6 in the morning. I touch fabrics in my sewing room repeatedly to see if they will be a "good choice" for my next project. My next project is almost always for another doll. I have forgone my lunch hour more than once to look for patterns for dolls on the internet. I can't wait for the kid to go to bed so I can get back to cutting out and pinning material. I have taken to texting pictures of the latest outfit to people before dawn. They know I am playing with dolls before the kid wakes up. I feel like it is all that I talk about anymore. I am worried that I am going to turn into some sort of Demi Moore doll collecting wannabe. That when it is all said and done it will just be me, the dolls, the cat, and the chickens. Perhaps I need an intervention.